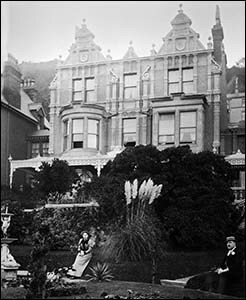 This building, now the Escape Boutique guesthouse, is testament to the enterprise of a Llandudno couple, Isaiah and Anne Jane Davies. Her father was William Owen of the King’s Head, one Llandudno’s first pubs. Isaiah was born at Pentre Isa Farm, on the Little Orme, c.1830. The young couple inherited the pub but had loftier ambitions – to build the first large hotel on Llandudno’s seafront. It’s said that they received the land for the hotel as settlement of debts incurred at the pub by John Williams, agent for the Mostyn Estates. The building, the St George’s Hotel, opened in 1854. It was the first in Wales with a lift to the upper floors. It was named after St George’s Church, where the couple worshipped in Welsh. Isaiah died, aged 51 or 52, in November 1881, leaving Anne Jane and their two daughters and three sons. He was buried at St Tudno’s churchyard, on the Great Orme. The couple had recently enlarged the St George’s Hotel to cater for demand. Anne Jane continued to run the hotel for many years. She bought Plas Fron Deg, almost opposite her church, in readiness for her retirement. It had previously been home to Francis Henry Chambers of the Chambers Brewery in Sheffield. He died at Plas Fron Deg in 1868. Anne Jane had the house rebuilt to suit her tastes and means. It was described in a contemporary newspaper report as “an exceedingly comfortable and handsome residence”. She died in February 1896, aged 72. When her funeral was held at St Tudno’s, most of Llandudno’s shopkeepers drew their blinds and a muffled peal rang at Holy Trinity Church. Five months after her death, the National Eisteddfod was held in Llandudno. A prize of £2 2s was given in her name for the best seven yards of home-made Welsh flannel. The building opened as the Escape Boutique guesthouse in 2005, after refurbishment by Sam and Gaynor Nayar. Echoing the Davies’ focus on modernity at their hotel, the refurbishment included installing new information technology to attract visitors who were used to staying in modern hotels.